The Next Generation of High-Powered Microcontrollers « Adafruit Industries – Makers, hackers, artists, designers and engineers! Despite this proliferation, at least for now, the maker market for computing hardware sits on top of three, somewhat unequally balanced, legs. 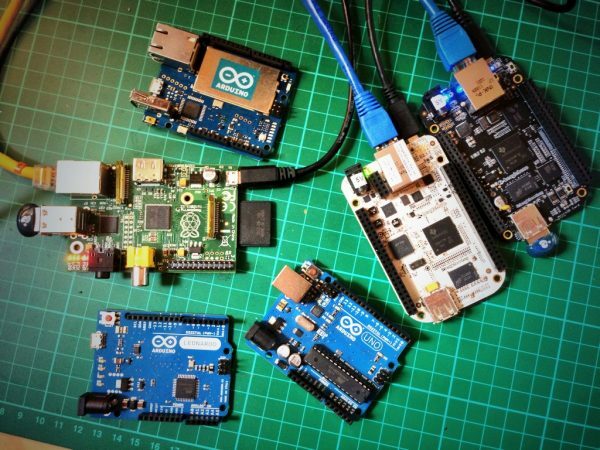 In one corner, despite all the recent legal troubles, is the now venerable Arduino and a large number of compatibles and spin-offs, in the other is Raspberry Pi. The third leg, perhaps more arguably, consists of boards based around the ESP8266 and ESP32. Not a single company this time, but a community. Because what these three pillars of the community share is just that, community. About and around them are active, vibrant, communities. Over the years I’ve been excitedly told about the next Arduino or Raspberry Pi killer more times than I can recall. I’ve now even been pointed at an ESP8266 killer once or twice. One may come along, but nothing has ever come of it to date. It’s not because the boards I’m shown are bad boards, or that they aren’t price competitive, although sometimes they just aren’t, but because it’s hard to build large communities, and there has to be a reason for an existing community to move on. It appears that “good enough” is sometimes all that’s needed. However, it is very clear that the current state of the board market is in transition. Just as the way we’re using computers is changing, the way we build hardware is changing with it. Because of that, manufacturers aren’t entirely sure how people are going to use their product. Like our other computers, microcontroller boards have become communication tools. It’s just that, at least for the most part, they’re talking to each other, rather than to us. At the moment, we’re seeing both a collapse in the number of form factors, and what feels like a sea-change in the languages and methodology to program the boards we’re using. After the many experiments we’ve seen over the last half decade, there is now little question that the Raspberry Pi has become the defacto standard form factor in the single board computer market. While in the micro-controller market things are a little bit more complicated, with Arduino in the process of abandoning their “classic” form factor that has for some years been the standard in favour of something more modern, the community seems to be adopting Adafruit’s own Feather as the next standard. Spanning both the Arduino community, and the community that has grown up around the two new Espressif chips, the Feather form factor has brought multiple chipsets, and snap on attachments known as “FeatherWings,” under a single roof which makes a lot of sense. Because, perhaps the most interesting thing going on in the micro-controller market right now has little to do with the hardware, it is hardware agnostic. Instead it’s all about how we build, rather than what we build with. When it arrived, the Arduino was a massive disruption to the existing microcontroller ecosystem. However the disruption it brought was only partially to do with the hardware, and far more to do with the development environment that came with it. The success of the board spawned any number of clones and counterfeits. However, it was the existence of derivatives that was by far more interesting. People experimented with features, but reassuringly the boards themselves could be used inside the familiar Arduino development environment. Arguably it might well have been the addition of “official” third-party board support, that drove some of the adoption of the ESP8266 in the early days. Evidence of this can be seen in the community that has formed around the ESP-based chipsets. While the chip’s Arduino compatibility is a selling point, the community-built Lua development environment is actually far more widely used. The Adafruit Gemma M0 was the first board to run Circuit Python out of the box, with a host of others following including Metro M0 Express, Metro M4, Feather M0 Express and a soon to be released Feather M4. High-level language support is fundamentally disruptive to the the way we currently build hardware. Traditionally developing firmware for hardware has taken infrastructure, sometimes a lot of infrastructure. Back before the Arduino came along, you needed to buy a—usually fairly expensive—development board from the manufacturer, install a proprietary development environment, write your firmware, and then finally buy individual chips and roll your own PCBs. The Arduino fixed that, but what it didn’t fix was the necessity to install software, drivers, and hack away in a language that, to most developers, is foreign. Now when you plug it in a board running CircuitPython it will simply show up on your desktop as a external drive. Edit the code.py file on the drive, in whatever text editor you want to use, and changes to your code are run as soon as the file is done saving. No installation, no compilers, no proprietary development environments. You can write your code on Windows, macOS, linux, or even on a ChromeBook. It doesn’t matter anymore, and that’s what makes it powerful. Most people, and most makers, want to solve a problem. While, for some, the specifications of the board really matter, those people are by far the minority. In a move that mirrors the changes we saw in the desktop and laptop computer market, our microcontroller hardware has become “good enough” that we now don’t have to worry about the underlying technology. If high level languages bring more accessibility to people that want to make use technology, we as hardware developers should welcome it, promote it, and above all don’t look down on the people using it. Because there’s more disruption to come. The last year or so has seen a coming of age for the FPGA. Which, even more than microcontrollers, have suffered from an infrastructure and usability problem. Stuck in a ‘pre-Arduino’ age, the FPGA has languished while microcontrollers have become far more usable, and accessible to non-specialist developers. Appearing somewhat lost after their legal troubles you have to wonder whether Arduino might manage to do it again and reinvent themselves, integrating FPGAs into the standard Arduino toolchain and turn configuring an FPGA using Verilog into yet another “Hello World” of hardware. While their new Arduino MKR Vidor 4000 may do this, it has yet to been seen whether Arduino Create can make programming the FPGA easy. This move, though, actually appears to be moving Arduino away from its open source roots. There is no open source toolchain for the Intel Cyclone FPGA that they’ve used in their new board. When it comes down to it, I actually think that the next generation of high powered micro-controllers will be defined, not by their hardware, but by their user experience. Programmed using an easily accessible, and widely known, high level language like Python, and perhaps configured under-the-hood using yet to be written tools that make using an FPGA as easy as today’s microcontrollers. The future of hardware is about accessibility. I found this article very insightful, as one who has been a part of (sometimes more actively than others) the Adafruit community since soon after they opened business, I definitely feel the supply and demand trend shifting towards what people know how to do, and thus feel comfortable doing. This does not intend to detract from any of the other fine maker companies out there, many of whom I also buy from like SparkFun, DFR Robot and Servo City to name a few. I do however bow my hat to Adafruit and it’s founders as what history will remember as the beginning of something new and powerful for our time. I’m not the only one who feels similarly either, as a huge community of devoted people has grown up around the company that makes Adafruit products some of the best-supported things you can buy. Using the latest communications technologies and a weekly show from the onset also was something brand-new, like Game of Thrones was to the fantasy movie world, Adafruit was providing something new, something more than other companies followed later on to varying degrees of success. Adaptation of the feather profile for micro-controller products makes sense in this context, as like it or not, everyone in the world watches what Adafruit creates now and tries their best to copy it in their own products. Perhaps Lady Ada and Adabot (coolest nickname bro) are too humble to fully rationalize the impact they are having on not just their own financial fortunes, but on the future of our world. History will bear this out I feel, but this article is a beautifully-written history and sensible outlook on where we were and how we got here. For the last 12 years I have been prone to purchase every shiny new microcontroller that hits the market to kick the tires. Being an early adopter has left me with many pieces of hardware that failed the test of time; either they were too difficult to use; or the documentation was not there; or the support faded so no community growth. This article really resonated with me and the big questions I have been pondering about the future of microcontrollers. Good job! Great article! Starting out with PICs via the BASIC Stamp and seeing every derivation of form factor in between from SIMMStick to Arduino I’m really happy to see the industry settling on a reasonable hardware agnostic DIP package with a consistent community supported language / libraries. (even if it meant having to switch to a language with braces and semicolon line endings) Now if we can just get a better IDE than that Arduino piece of cruft. Admittedly, I have not tried Arduino Create but the online compiler concept doesn’t really interest me. Currently, Visual Studio with the Visual Micro plugin is about as good as it gets but Sublime Text with Stino is hot on its tail if they could only get more boards supported. It’s pretty hard to argue with the CircuitPython concept of “programming” the chip though! Cheers. Great article! Starting out with PICs via the BASIC Stamp and seeing every derivation of form factor in between from SIMMStick to Arduino I’m really happy to see the industry settling on a reasonable hardware agnostic DIP package with a consistent community supported language / libraries. (even if it meant having to switch to a language with braces and semicolon line endings) Now if we can just get a better IDE than that Arduino piece of cruft. Admittedly, I have not tried Arduino Create but the online compiler concept doesn’t really interest me. Currently, Visual Studio with the Visual Micro plugin is about as good as it gets but Sublime Text with Stino is hot on its tail if they could only get more boards supported. It’s pretty hard to argue with the CircuitPython concept of "programming" the chip though! Cheers.